Bundesliga | Elber: "Sundays are boring without the Bundesliga!" Elber: "Sundays are boring without the Bundesliga!" Munich - When it comes to Bundesliga success, few match the achievements of Giovane Elber. 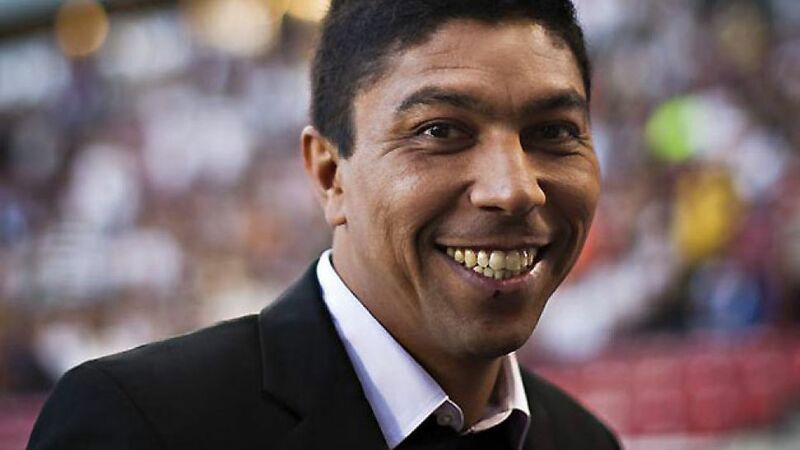 The former striker notched a staggering 92 goals in 169 appearances for FC Bayern Munich between 1997 and 2003, spearheading the Bavarians to four league titles and even UEFA Champions League glory in 2001.
bundesliga.com: Giovane Elber, many thanks for talking to us. How have you been coping with the long summer break? Giovane Elber: I can't wait for the Bundesliga to start up again because Sunday afternoons are boring here without it. There's no Bundesliga, Italian or Spanish league. We've got the Olympics at the moment, so we can watch that, but a lot of people watch Bundesliga in Brazil. We have live games on Friday, Saturday and Sunday. bundesliga.com: The Bundesliga has already overtaken Italy in the UEFA five-year coefficients. Do you think it can compete with the Premier League and La Liga too? Elber: I think so. The Bundesliga is very strong. I hope that other teams, not just Bayern, are able to reach the semi-finals or the final, both in the Europa League and in the Champions League. bundesliga.com: How attractive is the Bundesliga for foreign stars at the moment? Elber: Very. In the past things were different. Brazilian players would always choose to go to Italy, Spain, England and Portugal, but in the past four or five years, players have realised that if you get the opportunity, you have to play in the Bundesliga. bundesliga.com: Once again several South American players, including Junior Fernandes (Leverkusen), Junior Diaz (Mainz) and Fagner (Wolfsburg), have moved to the Bundesliga during the summer. How difficult is it for foreign players to settle in Germany in your experience? Elber: It was easier for me because I came from Switzerland to VfB Stuttgart and could already speak the language. For the ones who come directly to Germany, it's difficult. The language is completely different, as is the mentality and culture. Unfortunately a lot of players come here and think they can just play football and not not have anything to do with the culture. That's wrong in my view, because you have the chance to learn something new. You can play football anywhere, but it's important to communicate with your team-mates and understand the coach. A lot of people ask me how I managed to earn the respect of the Stuttgart fans and then the Bayern fans, or even Bundesliga fans in general. It's because I communicated. If you don't communicate with people or give any interviews, nobody will say you're a good player or a good guy. bundesliga.com: Is the 2012/13 title race going to be all about Bayern and Dortmund or can you see another club competing? Elber: It's hard to say, but I think it will be Dortmund and Bayern again. Obviously there are other teams like Schalke who can perform on any given day. Who knows? Maybe there will be a surprise package, but I think it will be between Bayern and Dortmund. bundesliga.com: Two of your former clubs, Stuttgart and Gladbach, did very well last season. Can you see them reaching similar heights this time round? Elber: I hope that Gladbach do well again because their fans are unique. I experienced so much in the year I spent there. Unfortunately I wasn't able to give back what the fans gave me on the pitch, but it was a great atmosphere. I'll be crossing my fingers for Gladbach once again this season and hopefully they can make it into the group stages [of the UEFA Champions League]. As for VfB Stuttgart, I'll be crossing my fingers for my old friend [and VfB sporting director] Fredi Bobic. It wasn't easy for him when he arrived at Stuttgart because there was no money, but since then Fredi and [coach] Bruno Labbadia have done some great work. I don't think they'll be challenging for the title as they're a bit too inexperienced for that, but I think they can go a long way. bundesliga.com: Which other teams should we look out for this season? Elber: Hannover 96. What they achieved last season was incredible. Hopefully they can carry on where they left off last season. They got really far in the Europa League and performed really well in the Bundesliga too, so I hope they do well. Maybe Hamburg as well. They're the 'dinosaurs' of the Bundesliga and it was difficult watching them struggle last season. This year they'll do better.